No... that’s not a LightSaber. 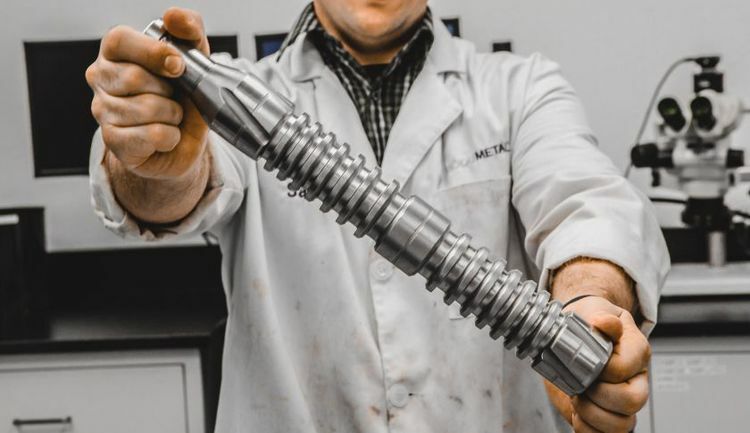 It's a complex alloy “grown” in a scientific laboratory by a startup company in Seattle and reported on by FORTUNE MAGAZINE. The idea of “growing” high performance metals using electricity and nanotechnology (in a cheap and energy efficient way), reminds me of when BOB LAZAR (the UFO "Cosmic Whistleblower", thorn in the governments side and all around controversial scientist), described the “injection mold” concept of the Non-Terrestrial Flying Saucer technology he reported to have worked on back in 1989 at an über secret military sub-base south of Area 51 called S4. This simple impression Lazar got when he described climbing into the extraterrestrial spacecraft for the first time, has always stuck with me and carried an air of importance. Lazar described a craft without bolts, rivets or even a single sharp or angular edge. Everything was rounded. The whole spaceship, seemed to Lazar, to somehow have been fabricated from a single piece of interactive alloy. Back in 1989, the only thing he could relate the visual experience and possible production method was an "injection mold" type of process. Fast forward a quarter century, and as you may be aware, we can already print (some) metals on a rudimentary level using 3D printers... and someday, it's theorized that we might be able to print on the atomic or molecular level. Sadly, humanity is no where near this technology today (as far as the public knows). BUT, the article in FORTUNE MAGAZINE describes a process that is in-fact quite unique, and this technology of “growing" metals seems that it could become a game changer if adequately researched and developed. And it's already happening! High-Five to science. So I'm fascinated to learn more about this company and their specific technique, as I too think it might hold a key to understand what Lazar witnessed during those months in 1989. What other technologies would the most guarded BLACK BUDGET PROGRAM of the United States (or a faction there of), be hiding from public scrutiny, the scientific community and humanity at large? What do you think? Be sure to leave your thoughts in the comments below.